Brett Terpstra discovered a neat way to control your Mac via Mobile Safari on your iPhone. Inspired by a blog post on the topic, Terpstra put together a simple Web app that provides a full interface on your iPhone for volume control, launching and quitting applications, and many iTunes functions—including volume and EQ. It also provides interface feedback and updates you with current info from your Mac. To make it work, you must first set up a local Web server using your own account—which can be tricky if you don’t know what you’re doing—and engage in a bit of Terminal trickery to enable the PHP scripting language. After that, simply move Terpstra’s HomeControl files, which he provides for free on his site, into your ~/Sites folder, and you’re ready to use Safari to gain access to your Mac. 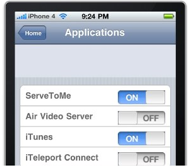 Terpstra also provides instructions for customizing HomeControl to launch different apps and activate certain iTunes EQ presets. If you’re handy with jQuery, PHP, and HTML, the app can be further customized, and you can even customize the app’s icon on your iPhone’s home screen. Check out a short proof of concept video Terpstra posted, demonstrating the app in action, embedded below.